Strength calculation rack design for «Kifato MK"
Commissioned by the LLC "Kifato MK", a series of strength calculations shelving structures, the appearance of one of the computational models which are shown in the figures below.Most of the calculation of shelving construction was carried out in an interactive mode with the representatives of the company - if any profile design does not satisfy the conditions of strength - quickly offered a different profile from the rolled metal available in the enterprise. Metalwork rack with mezzanine located in a warehouse complex building. Shelf space is a multilevel structure, intended for the storage of goods. The rack structure is supported by columns (140h140h5) height of 2880 mm installed with a pitch of 3200 mm in width designs. The support columns are connected to braces (pipe kr. 30x2) and beams of sigma profile forming a platform for installation of the struts of the vertical frames Ω-shaped perforated profile (minirack). 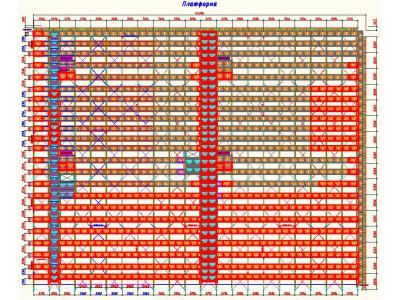 Each pair of struts connected by diagonal braces (27h11h2). On racks fixed installation beams pallets on them. 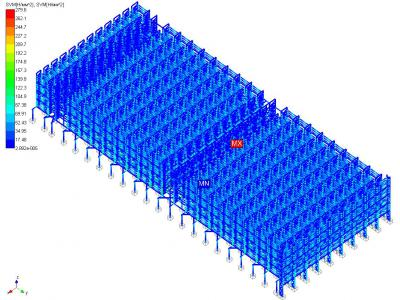 Also, the side of the main rack structure with mezzanine installed additional shelving section formed by the uprights ω-shaped perforated profile (100h2). Racks bind braces (45h25h1,5). When calculating the racking design took into account its own weight and the weight of the load that fills the shelves of the rack. 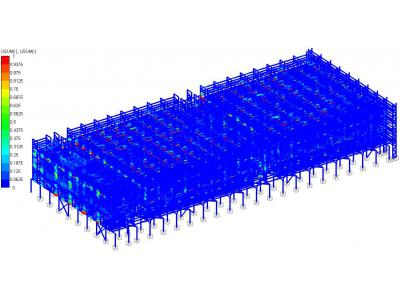 To evaluate the performance of the rack structure following calculations were made: the static and the calculation of the stability. 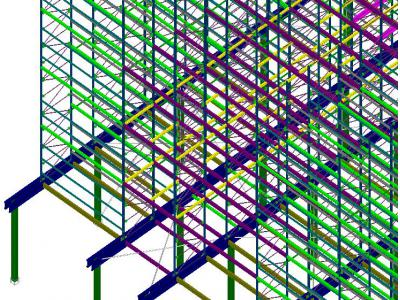 As a check calculation carried out by checking the rigidity design maximum allowable value of cantilever deflection elements. In the static load were all based in one uploading, since the structure is located indoors and wind and snow loads do not act on it. Map equivalent (von Mises) stress is seen that as compared with the yield point of the material of the rack there is a significant safety factor, i.e. design is quite efficient. A comparison of the maximum permissible deflections with GOST 28766-90 "Racks. 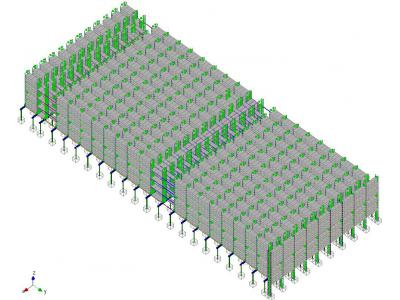 Bases for "showed that the rack structure is of sufficient rigidity and additional reinforcements are not needed. Tested as the total stability of the construction. As a result of the calculation obtained by the least value design safety factor 8.98 (according to SP 16.13330.2011, p. 4.3.2 with the p. 4.2.5, 4.2.6 stability idealized linear elastic frame model is considered to be secured if K mouth ≥ 1.3 ). Thus, the stack structure is stable under the given load. 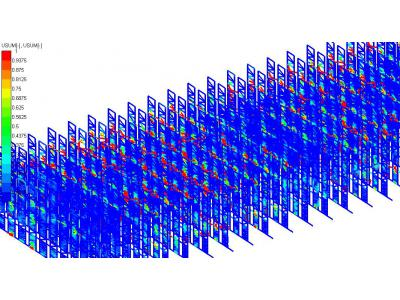 Analysis of the results of static analysis shows that under the given design loads, equivalent stresses arising in the frame structure by using said cell sections, do not exceed the yield strength of the materials used, i.e. necessary strength is provided. The design does not require additional measures to increase its stability. Minimum this design safety factor of the rack is 8.8 . 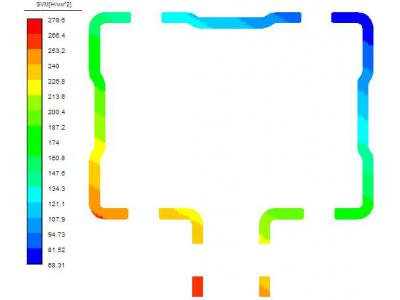 Check the bearing capacity of the most loaded design elements showed that all operating conditions coefficients have values ​​less than one, it is permissible and acceptable work suggests elements. Thus, we can conclude that the load capacity structures of data elements is provided. Summarizing the results, we can conclude that the rack structure can bear the load applied to it, and does not require additional measures to increase the strength characteristics. 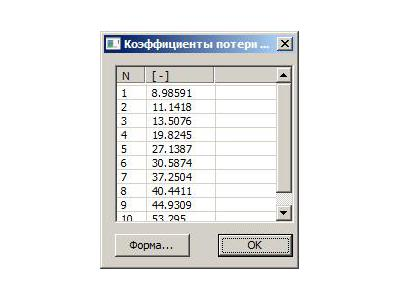 Consideration of the draft corresponds to the Russian standards (GOST 28766-90, SP 16.13330.2011, 20.13330.2011 SP). This is evidenced by the conclusions reached above.